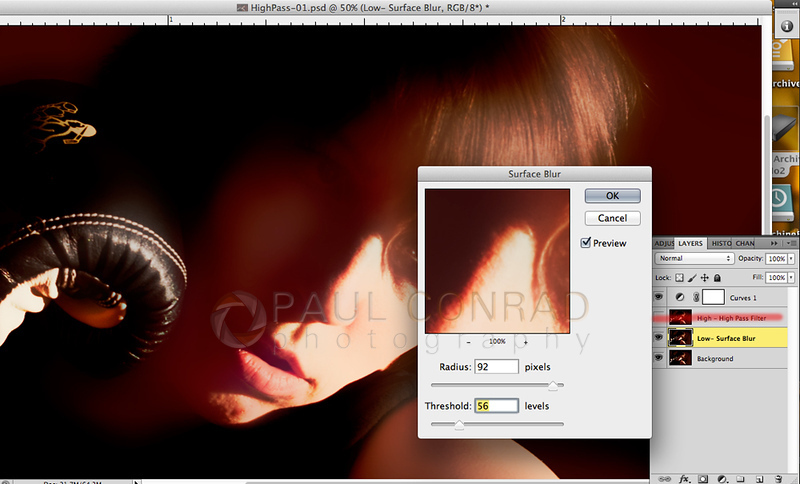 Using this filter in Photoshop to sharpen your images without increasing noise. Lightroom’s sharpening panel does act somewhat like the High Pass Filter as you can set the strength of the sharpening by using the Masking slider. You can see the effect if you old the “opt/Alt” key while adjusting the slider. More on this later. First, I wish to thank Photoshop Essentials with this tutorial which got me started using this tactic, and Michael Woloszynowicz of Vibrant Shot which has a slightly better way titled “Intelligent High Pass Sharpening.” The following tutorial is based on the Intelligent High Pass method. It seems to work the best for me and does not leave a halo on high contrast edges. 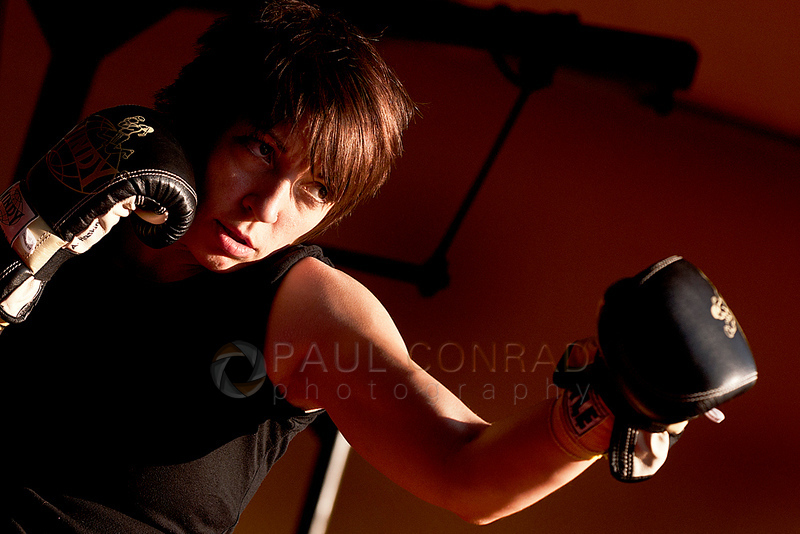 I chose a photo of my friend Anna as she prepared for a kickboxing bout a few months ago. This method is old news to some people, but I discovered that using this filter sharpens better than Unsharp Mask or Smart Sharpen. It just takes a little getting used to. It’s an added couple of steps to your workflow, but that not a big deal if you use multiple layers in each image. 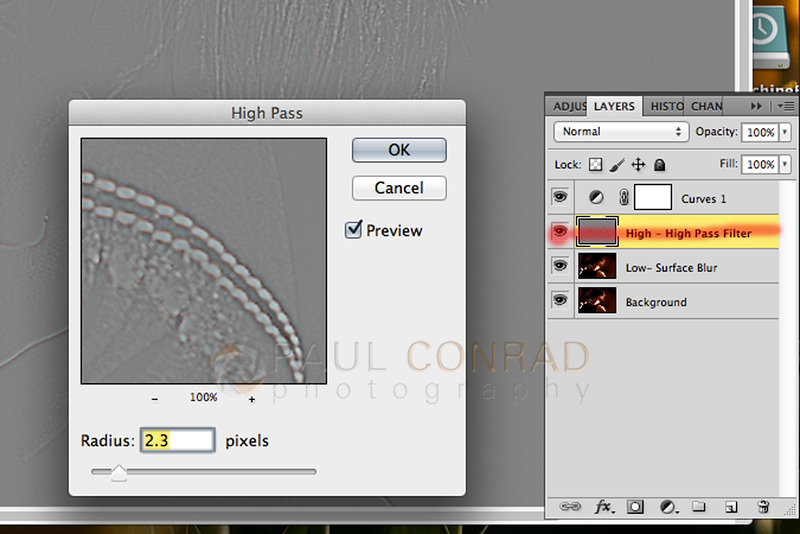 It’s called the “High Pass Filter” and it works great and is even better if you want to keep high ISO noise to a minimum. There are as many workflows as there are photographers, so choosing when you do this is up to you. I prefer to do it as my last step as it requires copying your background layer multiple times. That sounds scary, but it really isn’t . It’s a simple & easy process which gives you more control over your sharpening. I discovered it by simply needing a way to sharpen a photo of my father-in-law in the Pacific Science Center during the King Tut Exhibit. Because it was so dark, I was at ISO 3200 and the noise was more than I wanted. Sharpening the image via Unsharp Mask or Smart Sharpen just increases the noise. So I Googled how I can sharpen and this technique popped up. I can say I’ve used this procedure for at least 2 months so I feel confident it works. 1. 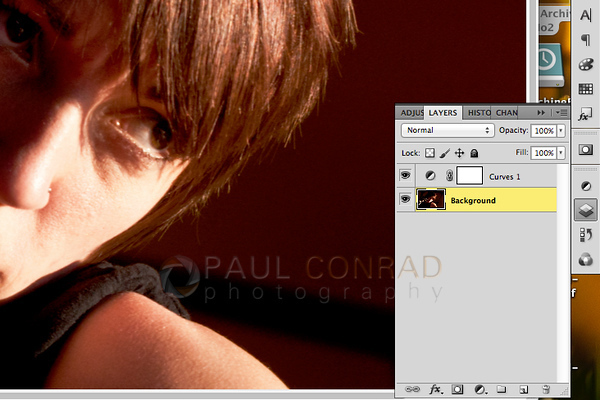 Copy the Background Layer – First, make sure the image is toned the way you want it. Save the image. Always save before going into a new step. Sharpening your image should always be the last step. The First Step is to tone it the way you want it. Sharpening should be the last step. Click the “eye” on the High layer to make it invisible. Highlight the “Low” layer. Now start the “Surface Blur” tool by going to Filter > Blur > Surface Blur. You have to think a little different with the Surface Blur filter because when you apply the High Pass Filter to this layer, it takes the INVERSE of the settings. With the radius, the higher the radius, the more sharpening even though the image becomes increasingly blurry. Zoom into an area with a sharp edge. Adjust the Threshold setting to about 30 or so. This sharpens the edge in the last step, yet does not give the halo look which is prevalent in using the HP filter on its own. Now apply. This filter is a memory hog and can take a little time. So if you have a rather large (150 MB or more), grab a cup of coffee, go for a walk, or just kick back to watch the progress bar march ever so slowly across the screen. Click on the eye icon of the High layer and make it visible. Initiate the High Pass filter by going to Filter > Other > High Pass. Adjust the radius by zooming into an area with a sharp edge . In portraits, use the eye. Because “eyes are the windows to the soul,” having sharp eyes in portraiture is very important. Adjust until you start seeing a halo effect in the sharp edge. Usually you only need to go to a 4 or 5 radius to get significant sharpening. Click OK. Now the layer will be gray with some sharp details that will look like a relief map of your photo. 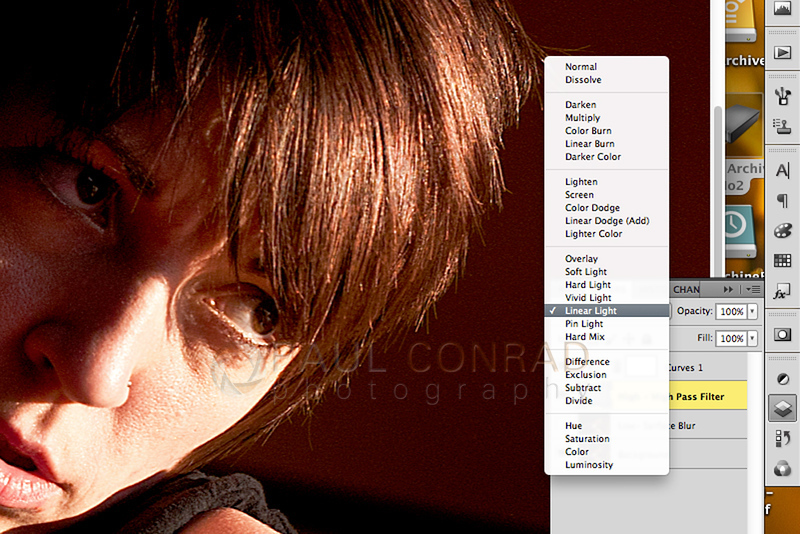 Go to the Blending Mode drop down menu in the Layers Panel and choose Linear Light. WOW!! Super Sharp! Delete the Low – Surface Blur layer. You no longer need this. It is just eating up digital space. ***The Blending Move changes the overall sharpness of the image, where the Opacity changes the sharpening effect of the layer. The strength of the sharpness in Blending Mode varies from with each photo, so the best way to set the mode is to zoom into 50% or tighter and change the mode to choose the effect you want. The Opacity affects how strong the filter is applied. Again, playing with the slider to see the effect is the best way to figure out what is best for you. *** The great thing about this technique is you can change the sharpness to the layer without destroying the image or having to delete a layer and start again. It is non-destructive. Now depending on your workflow, you can either save as a new file or save over the original PSD/Tiff. I prefer to save over to keep from eating up too much hard drive space. Flatten your image if you need jpegs for the web. That’s it. Depending on how large your image is, it only takes an extra 2 or 3 minutes to implement this. Thank you for stopping by to read and view my work. Feel free to comment, critique, or just ask questions. Also, feel free to share and reblog, link to, and add your site in the comment section.